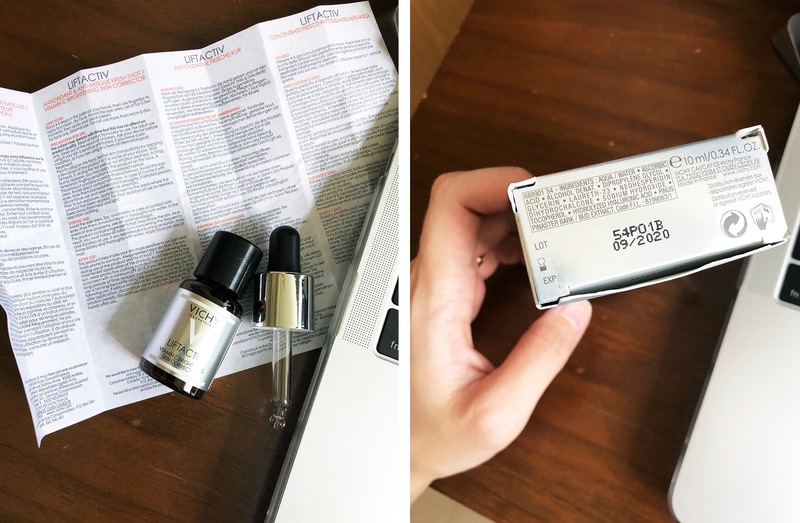 Many beauty brands have pushed me their vitamin C serums to try, but I’ve never really gotten to actually using one (because there are a million other beauty things to go through!) But recently, I’ve had some industry friends tell me about how these serums have made their skin brighter, firmer, and smoother — and just when I started to feel a little dull myself (my skin, that is). 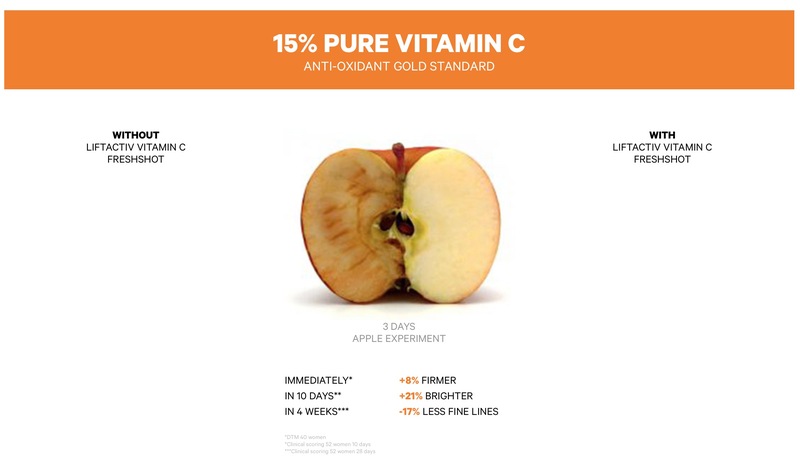 What is it about vitamin C that is good for our skin? Fact: it is a potent anti-oxidant that reduces pigmentation (like sun spots and age spots, not so much red spots from acne scars), and it also promotes collagen production, which results in skin becoming more elastic and firmer, and ultimately looking healthier and younger. MY FIRST IMPRESSION: The instructions say, “place 4-5 drops on the palm of your hand, then use fingertips to apply to a clean, dry face (avoiding the eye and lip areas)”. It’s a pretty lightweight liquid that is less tacky than many serums I’ve tried, and it actually absorbed into my palm rather quickly, so I had to move fast. I was patting it on to my nose, cheeks, and cheekbones (where I have a few sun spots that I could definitely do without). The liquid gets absorbed by the skin very quickly, so I found it easier to pat the product in, rather than smooth it across the skin. In fact, I “dotted” my fingertip with a drop, and patted it directly on to specific darker spots on my face. The skin feels a tad sticky after application, and it started to tingle a few seconds later. This is my first time using a dedicated vitamin C serum, so the tingle took me by surprise. The tingle is very mild though, and now I understand why they keep repeating in the instructions to avoid the eye area. WHICH STEP? I used this serum (Vichy Liftactiv Vitamin C Brightening Skin Corrector) after a booster (Chanel Blue Serum) and lotion (Three Balancing Lotion), and before moisturiser (Three Balancing Emulsion). NOTE: The Vichy instructions recommends using this vitamin C serum after a booster, or on its own before sunscreen and moisturiser. APPLICATION NOTES: This little 10ml bottle is meant to be used just once a day, and is a 10-day shot. That means 1ml a day, though I suspect I might have applied twice that amount on my first try. The brand also recommends using this treatment two to three times a year. I clarified this further, and this serum can actually be used every day as well (but that’s going to get a bit pricey). POST APPLICATION NOTES: When using vitamin C on the skin, the skin does become a bit sensitive, and so sunscreen is very important, and so is staying out of the sun if you can. DAY 5: It’s day five of my Vitamin C treatment, and I can actually see that my skin is getting brighter…!!! The few spots of pigmentation on my cheek and cheekbone are still there (and pretty obvious without makeup), but those spots have been there for years. I’d be amazed if anything out of a bottle can make them disappear. Also, that tingly feeling I first had only happened the very first time I applied the serum; perhaps my skin is now used to the product. DAY 10: 10 days are over and that major sun spot on my cheekbone appears evidently lighter! I’m impressed that this serum works. Let me rephrase that… I wasn’t expecting it to fail, but I have realistic expectations when it comes to skincare, and I didn’t think anything could happen in 10 days. VERDICT: I’d recommend this for someone who thinks their skin looks a little dull. This 10-day booster will make skin glow! It’s also good for smoothing out fine lines and even for those with slightly more sensitive skin (but remember, it’s still important to do a patch test!). I particularly like that the formula is hypoallergenic and compliant with the brand’s sensitive skin standards, and includes 0.2% Natural Neohesperidine — a soothing compound that reduces inflammation. If you’re willing to invest, then I’d say, consider using this for a longer period of time (a month, which is about 3 bottles! ), and really see a difference in skin elasticity and fine lines. GOOD TO NOTE: This is vitamin C at the end of the day, and there are many vitamin C serums to consider; but the one from Vichy gives pretty immediate results, and I like that it comes in a small 10ml bottle. With vitamin C, once you open the bottle, you need to use it up within 30 days at least — because of the nature of it; it oxidises and doesn’t stay stable for long. You’ll notice that the Vichy bottle is brown (the good ones are), and that’s to keep out light in order to keep the product inside as fresh as possible. 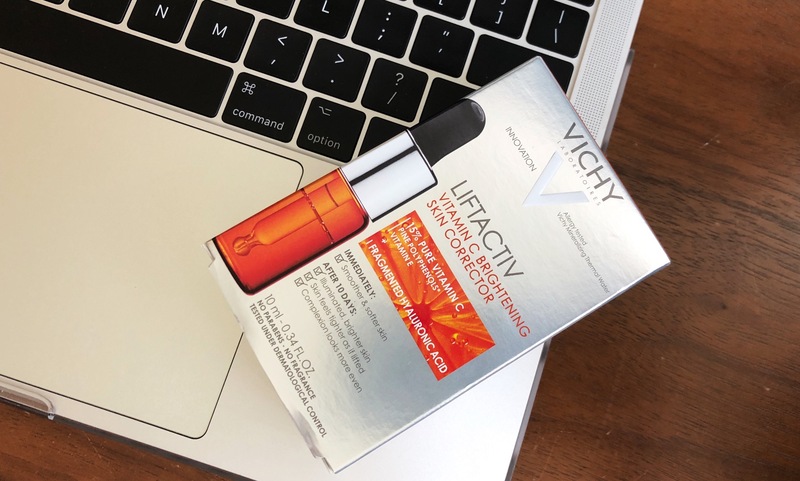 Vichy Liftactiv Vitamin C Brightening Skin Corrector, $52 for 10ml. Available at Guardian, Watsons and Lazada.